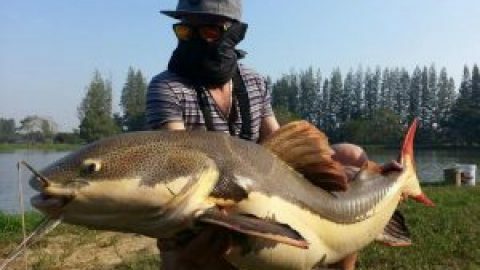 Another Thailand big game fishing trip to the Maeklong River saw a pair of European anglers fishing for Giant freshwater stingrays. Fishing with Okuma prototype stand up rods coupled with Okuma Makaira two speed multipliers the anglers fished with 100lb Power Pro mainline with long fluorocarbon leaders and large Owner Circle hooks. After mounting large livebaits onto the hook the fishermen were soon fishing on a wide bend of the Maeklong river. With the incoming tide indicating feeding time the anglers waited patiently for events to unfold. As large rafts of vegetation slowly drifted past a take was received causing the anglers to wind down hard into the unseen fish. Increased pressure soon saw the rod bent right down with its tip in the water at full parabolic curve. The unseen stingray slowly moved across the bottom causing line to slowly tick off of the tightened multiplier reel. As the anglers piled on more pressure the Giant freshwater stingray suddenly ground to a halt embedding itself into the muddy riverbed. The boat engine was quickly fired up and positioned directly above the stingray and once again pressure was applied with the rod. The unseen monster stingray was moved unceremoniously from its underwater lair on several occasions before once again going to ground. The battle with the unseen freshwater stingray lasted a further two hours before the stingray showed signs of tiring. After releasing its anchor like grip on the muddy bottom the stingray was cranked up off of the bottom where it languished for several minutes in mid water. Slowly but surely the Giant freshwater stingray was gently brought up through the water before it exploded through the surface angrily thrashing its tail. 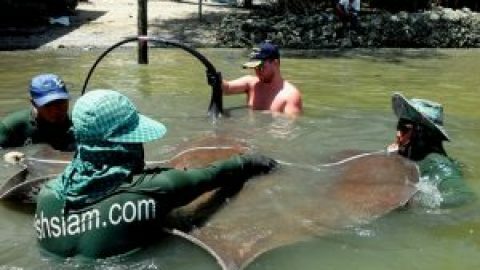 The Giant stingray was quickly pulled over the waiting net and the tail was wrapped for safety. 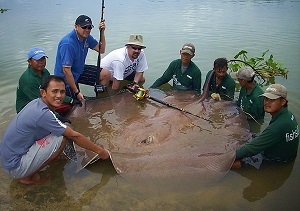 After transporting the stingray to the riverside the Giant freshwater stingray was measured and photographed. The large female stingray was estimated to weigh 190-200kg’s and was measured at a width of 1.9m with a length of 3.15m. The prehistoric Giant freshwater stingray was released shortly after back into the tidal river after all measurements had been recorded.